A Chinese man has died and 56 other people are missing after a tourist boat capsized in turbulent waters off the coast of Thailand's popular Phuket tourist island. [post_ads]The boat, called the Phoenix, was carrying 105 passengers, including 93 Chinese tourists and 12 Thai crew and tourist guides, when it capsized, officials said on Friday. They said a rescue operation was underway to find the missing 56. "One person is dead, 11 injured (2 have severe injuries, 5 minor) and 56 are missing. We continue to gather a team to search for them," the Water Safety Department of the Harbour Department said. "Forty-eight were saved," it said. The department said a dead man was pulled from the water. The Royal Thai Marine Corps said in a statement that the Phoenix sank about 7-kms (5 miles) from the shore and the boat had sunk to a depth of about 38-40 meters (yards). "We will search under the belly of the boat," the Marines said. 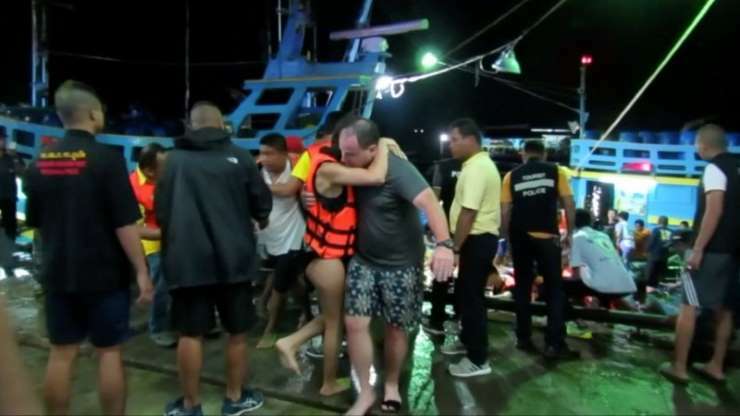 The Chinese embassy in Bangkok said in a statement that it had requested the Thai government make all-out rescue efforts, and that it had sent a team to Phuket to help. It added that the Chinese consulate in southern Thailand already had staffers on the scene helping its citizens. The Serenta, another boat sailing in the same area, also capsized. The yacht was carrying 35 tourists, five crew and a guide. Most of the passengers onboard the yacht have been rescued but two are still missing, the department said. Thailand is in the midst of its monsoon season which begins in May and usually ends in October. The monsoon season often brings high winds to coastal areas and flash storms. Thailand has poor road and boat safety records. Many tour operators have complained about lax enforcement when it comes to basic safety measures, including seatbelts in cars and lifejackets on boats. More than 20 people were killed when a tourist boat carrying 150 people capsized in Thailand's ancient city of Ayutthaya in 2016. Officials blamed the accident on overcrowding and reckless piloting. Chinese tourists make up the biggest foreign visitors to Thailand, with numbers surging in recent years due to the increasing popularity of Thailand's islands and cosmopolitan.